Everyone Piano is a computer keyboard simulating piano software, it can use the general computer keyboard to play the world famous piano music. With powerful timbre database, Everyone Piano's tone is lifelike and real-time. Even on onboard sound card, Everyone Piano can reach real-time musical performance, meantime it also simulates the pedal of the piano. Everyone Piano can customize the keyboard, play the halftone, support record, playback, music score show, inflexion and octave. Besides all the features above, Everyone Piano also has the demo and teaching music. Everyone Piano supports a mass of music scores for studying. 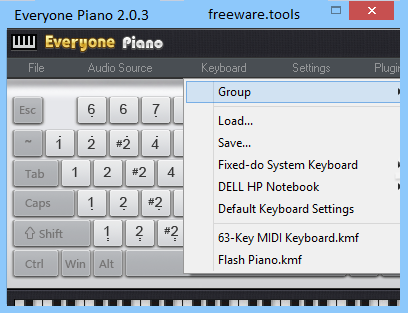 Everyone Piano is a simple and easy to use software utility designed to work from your computer keyboard, enabling you to learn how to play the piano. In addition, the application provides you with support for an external MIDI keyboard. The program allows your to play a virtual Grand piano using your computer keyboard, and record the played song, then save it to an EOP format file. Everyone Piano also provides you with a music player, so you can listen to the recorded song and see where you need improvement. Moreover, the program offers users support for stave and numbered musical notation learning. The note layout of the application is easily customizable, so users can adjust it to suit their needs. Moreover, Everyone Piano allows users to set the preferred left and right values for the OCT Shift. This virtual piano supports semitone playing and enables you to simulate the footplate of a real instrument. Furthermore, the program supports automatic accompaniment as well as rhythm packing and synchronization. Everyone Piano offers you various pre-existing music score files that can be used in order to improve your playing skills. The program can detect a VSTi audio source, in the form of a DLL file, and load it automatically, enabling you to change the Everyone Piano type of output instrumental sound. An important feature of the application is the possibility of using the Fixed-Do System, which is the European nomenclature used for teaching and learning music. In this particular system, the note Do is the equivalent of C as well as C-sharp. The application provides you with a wide array of customizable options, so that you can find what best fits you. The flexibility and ease of use offered by Everyone Piano make it a handy tool for anyone willing to learn how to play a music instrument.